The past couple weeks on Pinterest I have been seeing pins of people making their own fruit snacks. I kept thinking, I want to do that, but I never did. Then I saw a post by Miss Information, using a LEGO minifigure mold to make her fruit snacks. 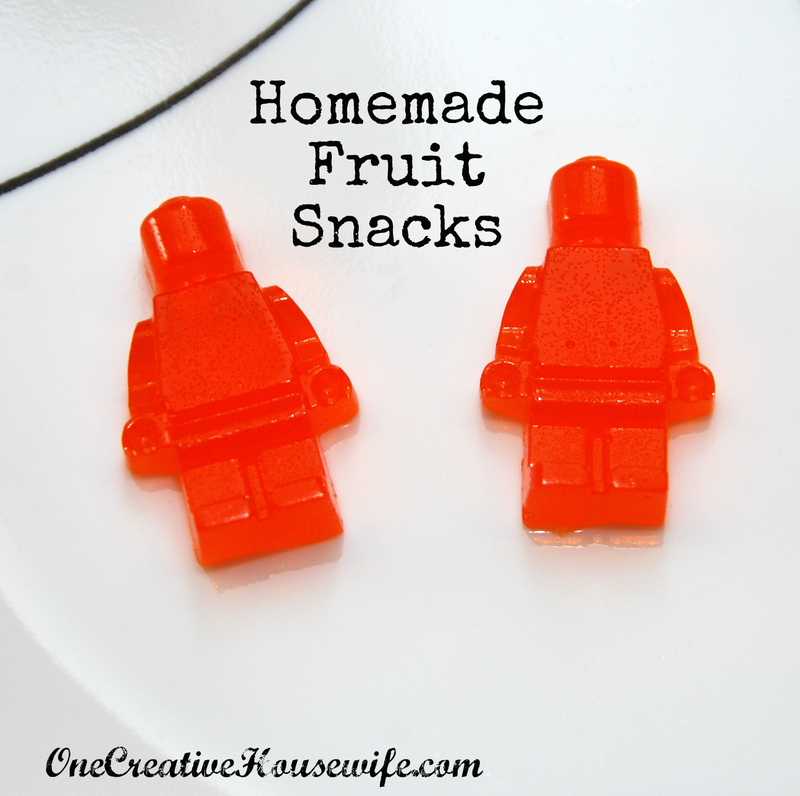 It just so happens I have the same mold, and when I saw her post I knew I had to make LEGO fruit snacks for my kids. I used the recipe from Six Sister's Stuff because Miss Information mentioned her's were sour and I was afraid my kids wouldn't eat them. 1. Sprinkle the Jello and gelatin over the water in a small saucepan. 2. Heat the mixture over medium heat and stir until the gelatin is completely dissolved. 3. Pour the gelatin mixture into molds and allow to set at least 20 minutes. 4. Unmold by gently pulling the fruit snack away from the side of the mold with your finger and popping each fruit snack out. When I poured the mixture into the molds I wasn't very careful. I thought it would be easy to wipe off, but it wasn't (hence the messy picture). Fortunately, when I popped the fruit snacks out of the mold the excess stayed on the mold. 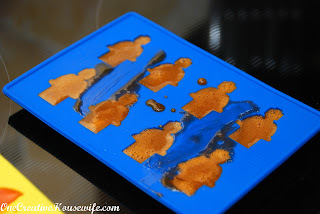 With this recipe I had enough of the gelatin mixture to make some orange slice shaped fruit snacks too. The day I made these I included them in my kids' lunches, and they loved them. My son was especially surprised to see LEGO men as part of his lunch. I will definitely be making these again to add a little something special to their day. Plus, I am always looking for ideas for party favors, and these would be adorable to include in any party bag. The only catch would be finding a mold to match your theme.